Is this simply a quest to slay a fell beast? Is it better to slay the monster and collect the reward? Or is it nobler to seek out the why? Would a creature blessed with the mark of the Land break with its fidelity and do murder? Or do you simply ignore the quest and abandon those in need to fend for themselves and find another path? Only the PCs get to decide. To Kill or Not To Kill is a Monte Cook’s Arcana Evolved adventure designed for four 2nd level characters. Characters will advance to 3rd level by the end of the adventure. 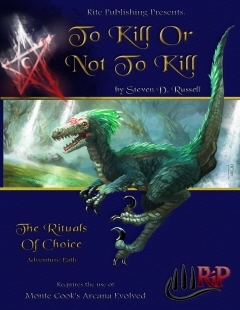 It is the second installment in the Rituals of Choice adventure path, a complete campaign saga consisting of 25 adventures. The campaign will take characters from this apparently simple monster hunt to an apocalyptic battle for the multiverse at 25th level. The campaign is episodic. The adventures can stand alone, although a plot arc runs through the entire series you can find part 1 A Witch's Choice HERE. The full arc becomes clearer with each episode, along with free web enhancements like the Player’s Guide and DM’s Primer. This title was added to our catalog on September 20, 2009.